Dr. Blue moved to San Luis Obispo in 1972. graduating from Cal Poly with a bachelor's degree in Biology. 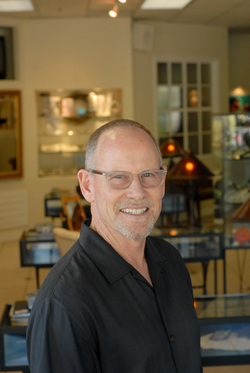 He received his doctorate in Optometry from the Southern California College of Optometry in 1981 and began his practice in San Luis Obispo in 1982. Dr. Blue resides in the San Luis Obispo area with his wife and two children. Having an overwhelming appreciation for the Central Coast, he participates in numerous outdoor activities with his family. Dr. Chang moved to the Central Coast and joined our practice in late 2007. He graduated from UC Davis with a bachelor's degree in Biology in 1998. 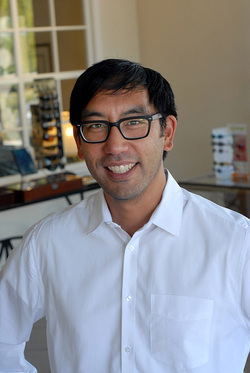 He received his doctorate in Optometry from the UC Berkeley, School of Optometry in 2006 where he received the Cal leadership award, clinical honors, and the Eschenbach Excellence in Low Vision Award. Dr. Chang pursued his interest in Low Vision Rehabilitation completing a residency at the Center for the Partially Sighted in Los Angeles, where he evaluated patients with vision impairment arising from conditions such as macular degeneration, diabetic retinopathy, and glaucoma. Dr. Chang and his wife Krista enjoy spending time with their three children, here on the Central Coast. Krista M. Martin, O.D., F.A.A.O. Dr. Martin graduated from UC Santa Barbara with a degree in Biological Sciences in 1997. She completed her doctorate in Optometry and a B.S. in vision science from the UC Berkeley, School of Optometry in 2004. Dr. Martin pursued her interest in ocular disease management and primary eye care at the Veterans Health Administration Optometric Residency program. Following her residency she taught at the UC Berkeley, School of Optometry, then continued to serve our nations Veterans as the Chief of Optometry for the Central Coast Eye Clinic for close to 10 years. She is an active fellow of the American Academy of Optometry, and lectures to practicing optometrists on the treatment and management of eye disease and glaucoma. Dr. Martin joined Envision Optometry in 2014 and is excited to provide personalized eye care to our patients.